Images for a plan to build a skyscraper complex in north Dallas have been making waves across the web. The so-called Harwood Phase XII would top out at 1,080 feet over the Texas city. 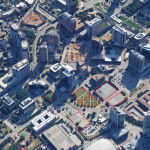 Dallas-based developer Harwood International submitted the proposal to the Federal Aviation Administration (FAA) in August as the buildings height means it may disrupt to flight paths in the area. Online, the images have been gaining coverage attracting significant attention despite the fact that the proposal is still awaiting approval and could change as plans are refined. The project looks set to visually dominate its surroundings, and developers hope it will attract visitors to the area. The renderings show extensive use of trees and other natural features to liven up the area. They will also complement the use of wood that is featured as an accent in the project. The towers are generally clad in glass, and often include eroded box forms with softened corners. “They are some renderings we had done a while back—they are really old,” Jihane Boury, Harwood vice president of leasing said. “We are still studying what we are going to do there.” Despite their age, the images drew recent online attention after a user posted to the Dallas section of social media website Reddit. The Dallas-based firm’s long-term plans appear to be in place as they aim for the structure be home to shops, eatery’s and high-rise residential flats.